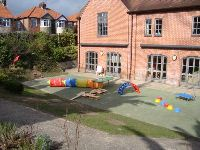 "Where children learn to play, and play to learn"
We are a pre-school situated in the North East of Ipswich. Established in 1985, we provide early education for children aged from 2 to 5 years old. So, why choose Noah’s Ark? Great spaces to play and learn – both inside and outside. Good staff to children ratios. Different activities on offer every day. Tapestry online Learning Journey, so you can see how your child is developing with us. Choose morning, afternoon or all day sessions, depending on your needs and availability. Termly Learning Review Sessions with key person and parent/carers. Complete our online application form or download the form located in our information centre and return it to the ​pre-school.